We’ve seen a lot of adorable animal-shaped rocking toys for kids, but not so many animal-shaped rocking chairs like these wooden rockers from Manny & Simon. Perfectly sized for tots, you can choose a dino, elephant, lamb, and monkey. These made-in-the-USA, simplistically designed, solid-colored rockers are constructed out of 100% post-industrial recycled wooden residuals, finished with zero-VOC paints. If you love the look, but don’t need a rocker, they also make sustainable wooden rolling toys featuring the same animal designs. 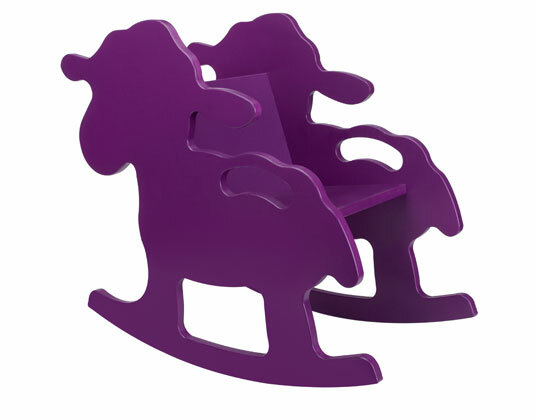 We've seen a lot of adorable animal-shaped rocking toys for kids, but not so many animal-shaped rocking chairs like these wooden rockers from Manny & Simon. Perfectly sized for tots, you can choose a dino, elephant, lamb, and monkey. These made-in-the-USA, simplistically designed, solid-colored rockers are constructed out of 100% post-industrial recycled wooden residuals, finished with zero-VOC paints. If you love the look, but don't need a rocker, they also make sustainable wooden rolling toys featuring the same animal designs.